He wasn’t having second thoughts about the whole parenting-gig, he was just exhausted in a way that he’d never experienced before. He wanted to be there for his new baby and otherwise he wouldn’t have bothered to come to the class. It has been 12 and 14 years since I was in his shoes but I know I felt pretty much the same as a new dad. I kept waiting to get the weekend off when I’d have some time to rest and recuperate but with a newborn, it’s all hand’s on deck. While the good news for parents is that it gets harder over time, it’s important to know that there’s a huge amount of brain-development in the early years, so really being-there for your children shapes their growing-brain. There are three brain growth-spurts across the first six years and the degree to which you nurture your child will affect this development in positive or negative ways. What this means for new parents is that some of the most important parenting can occur when you are at your most exhausted. If you then have a lot of stress on top of the exhaustion, then it’s a double-whammy that makes life that negatively affects your parenting. e we do each night. Don’t worry, those days will come back and you’ll appreciate a good night’s sleep more than ever. 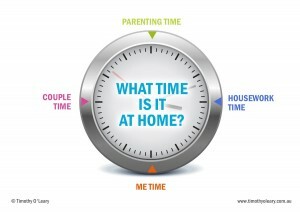 Until then, let’s get some strategies for managing life as a new parent, to help with exhaustion and stress. If you have a look at the graphic image below, you’ll see that life has changed dramatically for you both. 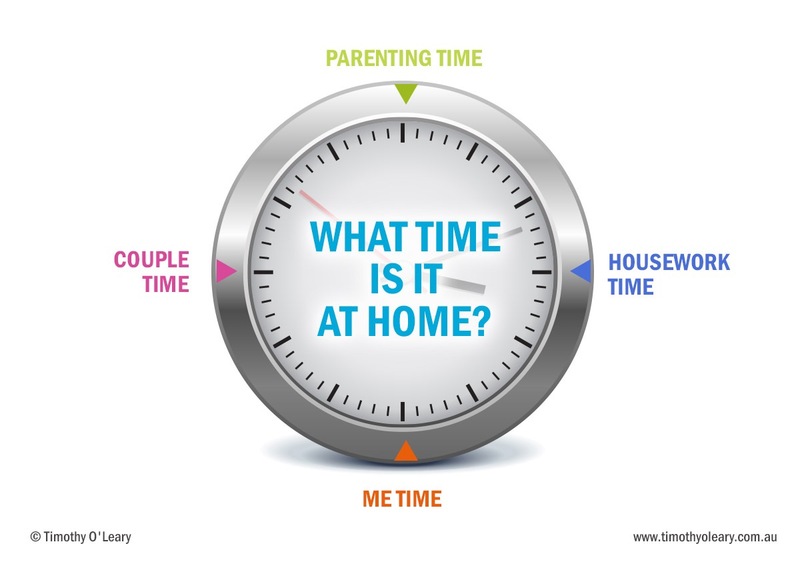 There’s a lot less ‘me-time’ and ‘couple-time’ than there used to be but a lot more time spent doing housework and parenting. Sleep has a big bearing on how you function as a human-being. It suddenly becomes very clear about how it could be used as a form of torture! Being chronically tired not only affects the quality of your parenting, it reduces your ability to think as clearly as you once did, so ordinary things like problem-solving and communication now become so much harder. And if like many of us, you weren’t the best communicator or problem-solver before kids, then Houston, we have a problem, because the challenges of parenting require us to be on our game. We can tackle exhaustion by finding time for catch-up sleep. This might see you taking bubs out for a walk in the pram, when she wakes up at 5.30 or 6.00 am, so that your partner gets an extra hour’s sleep. Or they do the same for you at the end of the day and across the weekend. Work as a team to help each other get just a little extra sleep. STEP 3 offer a solution So can we………………. In this example the dad explains his frustration as well as his desire to have more couple-time. His partner won’t feel like couple-time if he’s yelling at their son or at her. By using these three communication steps, he is more effective at problem-solving. Finally, it also important to negotiate some ‘me-time’ where you (and your partner) get some time-out from parenting and housework to unwind – be that on the squash court, the footy field or going fishing. Time will probably be a factor, so if you love golf, you might find you’ll play just 9 holes rather than 18. Try to do something active because exercise is a really effective stress-buster. If stress is getting too big to handle on your own, it’s not a sign of weakness, but that you are in a tough place. That’ s the time to reach out and get some help. This might be practical help from family and friends, or professional help, to get you back on top of things. With the right tools you’ll find that you can become very efficient at making the most of your catch-up sleep opportunities, as well as fitting a lot into your ‘me-time’. Your baby and partner will notice the changes in you and you’ll find yourself enjoying parenting. Your baby needs you to love, nurture and play with them and the less-stressed you are, the better you’ll be able to do this. In return, they’ll love you right back – nice one papa!